I've been getting dirty with Distress Inks again. 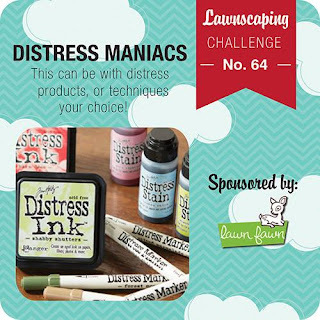 The challenge at Lawnscaping is to use distress products or techniques. I squished some Distress Inks onto a craft sheet then misted with water, and basically worked my way through them with the chevron stamp, picking up a little colour from the neighbouring colour. I like the grungy effect. Then I cut the birthday die out, layered the piece onto black card and stamped a small "happy" and added three sequins. Beautiful squishing and inking all over the place, Shirley! This is a standout card!! Brilliant! Very arty and contemporary. ooh, so cool! i love your background!thanks for playing along with us at lawnscaping! I love the colors you used! The background is awesome! Amazing job! So bright and fun! What a stunning background! That backgrouns is awesome!! And the negative die cut in black for the sentiment is perfect! love!